Virginia Cured Ham for sale. Buy online at Zingerman's Mail Order. Gourmet Gifts. Food Gifts. Berkshire hogs are a heritage-breed pig renowned for their full flavor. Third-generation ham curer extraordinaire Sam Edwards started using heritage-breed Berkshire hogs several years ago, then upped the flavor for this special edition country ham with peanuts. 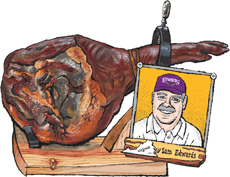 Sam took inspiration from the famed Ibérico Bellota ham of Spain. The hogs behind the legendary meat spend their last few months foraging and feasting on acorns and it has a magically delicious melting effect on their fat. Instead of acorns, Sam's hogs are finished on a diet that's very heavy in Virginia peanuts. Like the acorns in Spain, the peanut diet creates incredible marbling in the meat, and the fat takes on bellota ham's magical mouth-melting properties. Smoked over hickory for a week and aged for more than 18 months, this bone-in, hoof on ham is exceptional with the complexity and flavor to rival Europe's best. Very limited supply.